The 'Steampunk Chronicles' by Kady Cross has to be one of my most favorite series from Harlequin Teen. 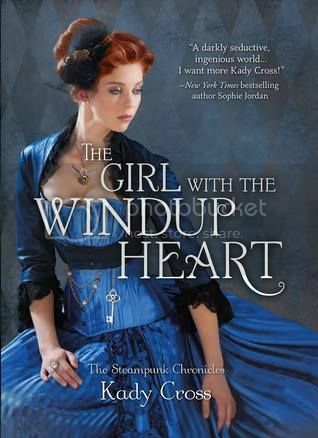 I was super excited to finally read 'The Girl with the Windup Heart', as I was excited to see how Griffin, Finley and crew were finally going to beat The Machinist. This book definitely did not disappoint, and is a wonderful addition to this awesome series! The book had two parts to the story. One part revolves around Griffin, Finley and crew verses Garibaldi, who, even in death, just will not leave Griffin alone. Seriously, this guy is evil like no other, and there was nothing that I wanted more than for him to be defeated once and for all. Can I just say that all of these characters work so wonderfully together as a group? They are all among some of my most favorite characters. I love Griffin and Finley’s relationship, as well as Emily and Sam’s, and Jasper and Cat’s. Not only are the relationships great, but the friendships are excellent as well. And I love that they are all willing to do whatever it takes to keep each other safe, and to defeat The Machinist once and for all. The other part of the story was about Jack Dandy and Mila. Jack Dandy is a character that I’ve loved every since we first met him in the beginning of the series. He’s so dark and mysterious, and I was thrilled that we get to learn more about him in this book. He has definitely had an interesting past. Jack and Mila were so super cute together, I adored them! I’ve really enjoyed the storyline for this series since the very beginning. It’s made for a really unique read for me, as I’ve not really read a lot of steampunk books. I liked that this book wrapped up all the loose ends throughout the series as well. I really hate to see this series end, as I’ve really come to love these characters. Overall; I really loved this wonderful addition to the 'Steampunk Chronicles' series. While I am sad to see this series end, I am really looking forward to reading Cross’ next series, expected out in 2015! I didn't realize this is the last book! I still need to read the one before it. Guess I have some catching up to do! I love this series and I never thought I'd be into steampunk until I started reading these and Gail Carriger's Soullessbooks. I am glad that the series wraps up with a strong final book. So many times the last book in a series tends to disappoint. I've been waiting for all of these to be out so that I can binge read them all at once. Like Christina mentions above, so often the last book in a series gets poor reviews. Hoping I will enjoy these as much as you have!